H. Rick Bamman - hbamman@shawmedia.com Midnight Sun Farm owner Nick Choate-Batchelder returns to the barn yard for more feed while feeding his flock of 600 chickens in Harvard. 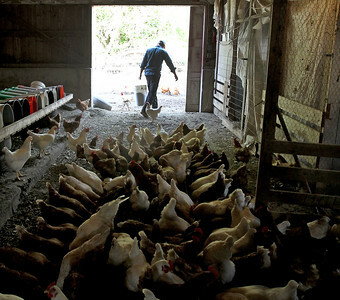 The chickens produce 45 dozen eggs a day. Choate-Batchelder and wife Becky Stark run the family-run Community Supported Agriculture program and market farm. Midnight Sun Farm worked out a lease agreement with Tom Perry, an investor who bought the farm at their request, so they could grow organic vegetables and free-range livestock there. H. Rick Bamman - hbamman@shawmedia.com Husband and wife team Nick Choate-Batchelder and Becky Stark with their sons 6-month-old Guss and 3- year-old Ray and family dog Jackson run Midnight Sun Farm, a family-run Community Supported Agriculture program and market farm in Harvard. 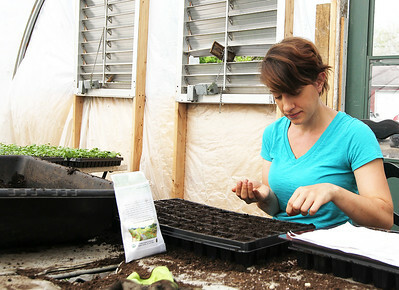 H. Rick Bamman - hbamman@shawmedia.com Midnight Sun Farm employee Lizz Rugg plants chard seed while working in a hoop house on the family-run Community Supported Agriculture program and market farm in Harvard. 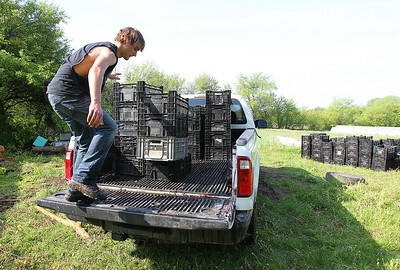 H. Rick Bamman - hbamman@shawmedia.com Midnight Sun Farm employee DJ Blue unloads harvest bins for cleaning at the family-run Community Supported Agriculture program and market farm in Harvard. Midnight Sun Farm worked out a lease agreement with Tom Perry, an investor who bought the farm at their request, so they could grow organic vegetables and free-range livestock there. 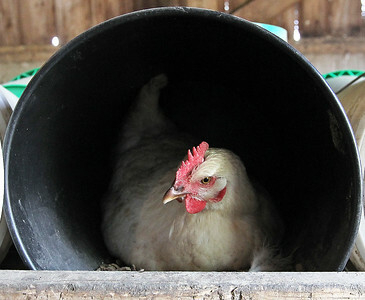 H. Rick Bamman - hbamman@shawmedia.com One of the 600 chickens that produce 45 dozen eggs a day at the Midnight Sun Farm, a family-run Community Supported Agriculture program and market farm in Harvard. 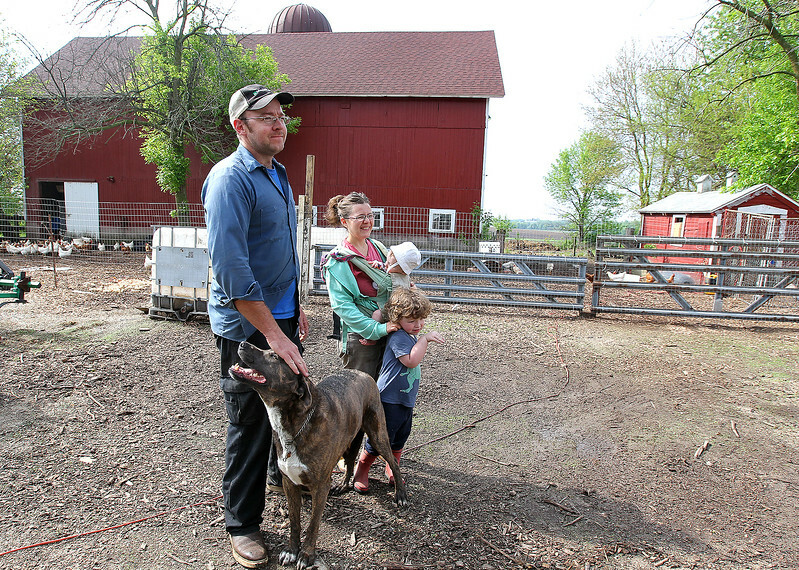 Husband and wife team Nick Choate-Batchelder and Becky Stark with their sons 6-month-old Guss and 3- year-old Ray and family dog Jackson run Midnight Sun Farm, a family-run Community Supported Agriculture program and market farm in Harvard.